AC power obviously poses a challenge to meter design due to its constant changing signal and other phenomena related to AC. 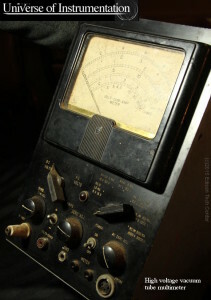 To measure the voltage the signal is rectified(converted to DC) by vacuum tubes and can be sent to a moving-coil meter. E.B. Moullin developed the first real vacuum tube voltmeter (1922) thanks to Irving Langmuir’s improvement of the triode vacuum tube. Voltmeters in the 1920s and beyond put AC current from the grid in the triode vacuum tube. DC current applied to an electrode (hot cathode) would pass through the metal grid and was received on the other side. The amount of electrons passing through the grid would change as the AC current changed the charge values in the metal grid. The max and minimum voltages could be determined by the DC current signal. An amplifier stage is usually added to the circuit which can increase the sensitivity of the meter and increases the input impedance. This allows the amount of power drawn by the triode on the main circuit to be reduced to nothing, and therefore the instrument can be highly accurate. 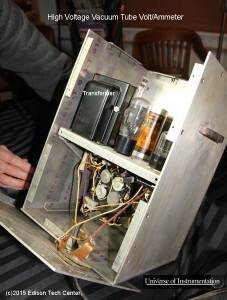 Note that vacuum tube voltmeters need time for the cathode to warm up before they can work. Does not disturb the circuit being measured. 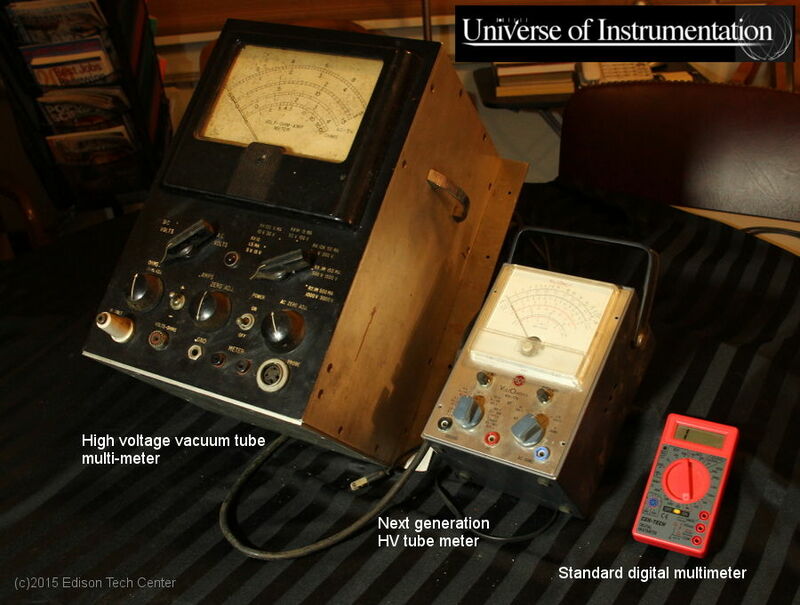 The quest to measure high voltages using vacuum tubes was something radio pioneers shared in common with the utility industry. Tubes used to measure and transmit radio signal were obviously designed differently but the idea of using thermionic emission with a grid in a triode was key to both pursuits. Below: see Bill from the Edison show us a few vacuum tube meters of various sizes and ages. You can see how vacuum tube technology got more compact over the years. These meters at the Edison Tech Center include a large 1930s meter, a 1970s meter and a 2000s era multimeter. 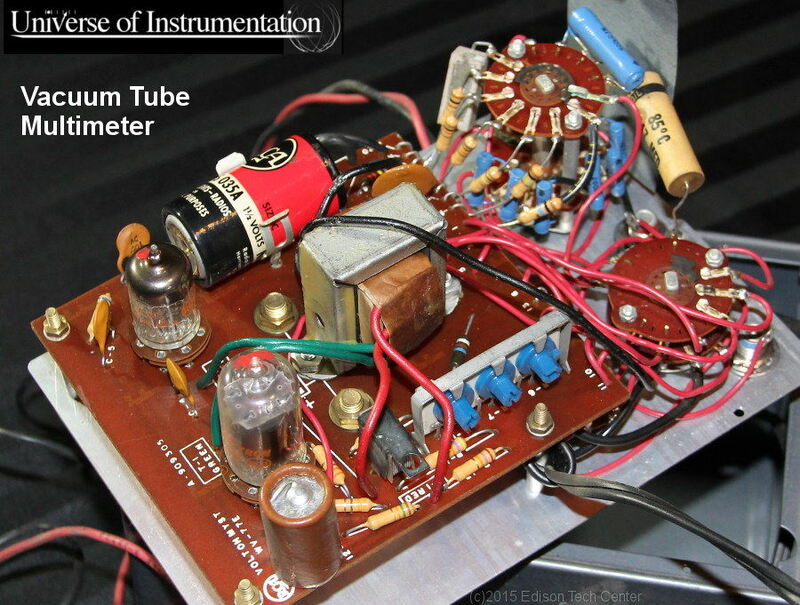 After the vacuum tube solid state technology replaced the vacuum tube, see our next section for semi-conductor based voltmeters.